Vacation rental cottage. Sleeps 7, 3 bedrooms, 2.5 bathrooms. Dogs allowed. Amazing Brooks Cottage. At the South end of Tybee Island and next door to Southern Cross. You'll find modern and vintage combined between these two homes. I know the beach is just a 4 minute walk, but I don't think I can drag myself off this porch and definitely not off this swinging outside bed! Screened in porches abound on this generous home! Outside rooms in the South are a MUST. Welcome inside lovely Brooks Cottage! You're going to be so happy here! Plenty of living room seating in Brooks. We always leave keys for you. But you can leave a key in the lockbox if you're just wearing your bathing suit! 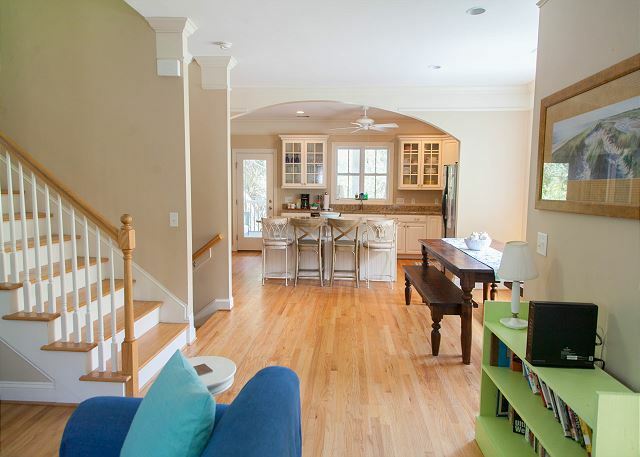 Living room to the kitchen and to more outside porch seating. Dining room and kitchen. Lots of open space and tons of seating. 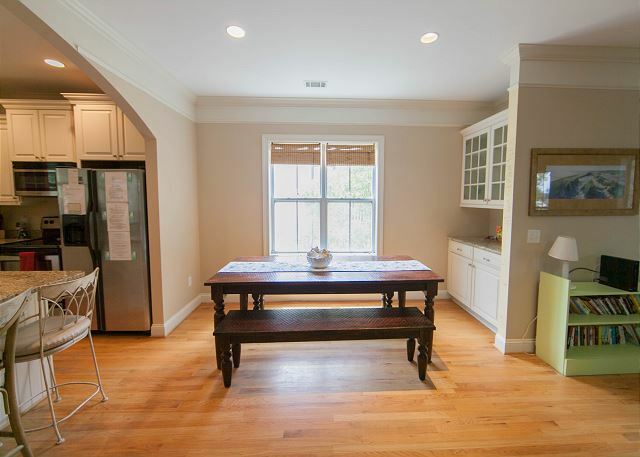 Counter seating in the kitchen, plus a large farm style dining room table. Porch to your left. Mermaid Morning Bliss (MMM Bliss) coffee for your first wake up on Tybee. You can purchase more at Seaside Sisters on Tybee. Proceeds go to help sea turtle conservation. Washer and dryer for your use while you're staying at Brooks Cottage! Bedroom #1. Queen and twin bed. Queen and twin bed bedroom. Double twin bed bedroom. Love these bright comforters! Full bathroom with tub/shower combo. 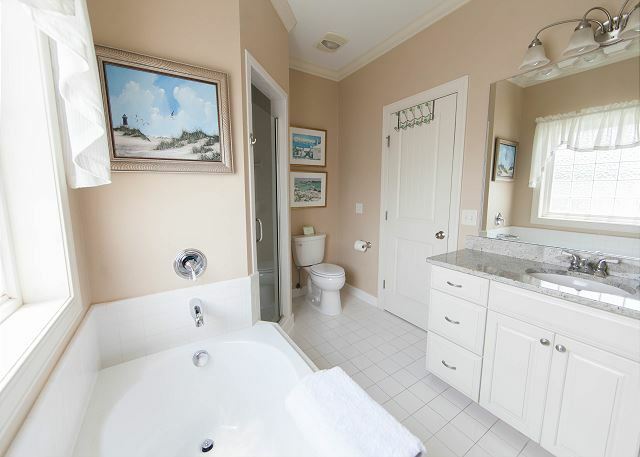 Full bathroom with amazing soaking tub and standup shower. Come on in! The pool is fine! Talk about relaxing on your vacation! So much seating will definitely revive you! Even the play room is awesome in Brooks! Great side yard. Brooks is puppy friendly and you'll love being here! 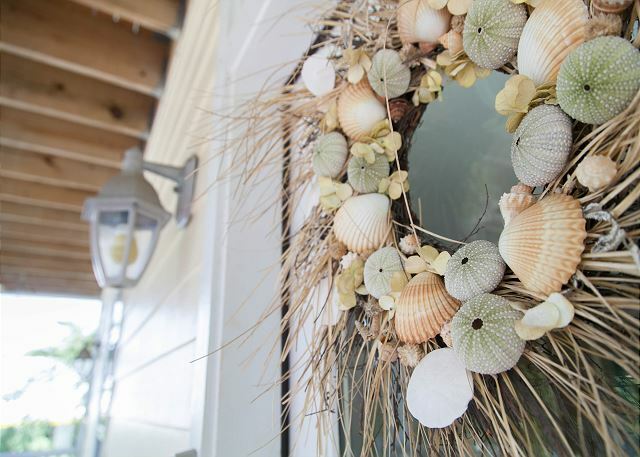 When you think of a "beach house" you think of white washed walls, lots of places to relax and nap and touches not found in your year-round home. 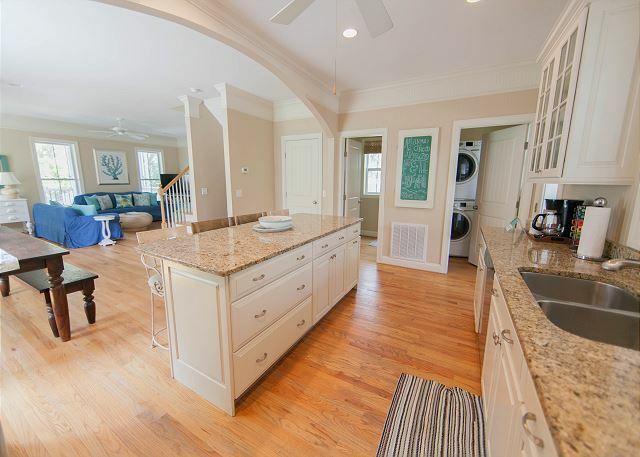 Brooks Cottage is the perfect definition of a beach house! Accommodating 7 guests, this home is large enough to take care of everyone's "alone time" but to also have space to come together and enjoy each other. Lots of comfortable seating for talking and napping, and an outstanding kitchen for concocting fabulous fresh seafood dishes. The fireplace is not a working fireplace. 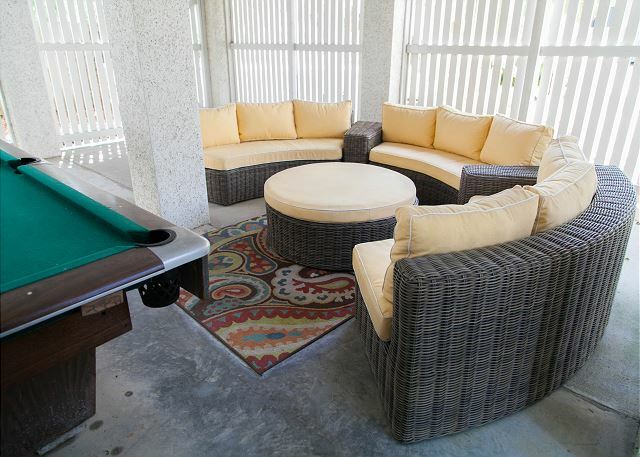 Downstairs you have a pool table to enjoy while you wait on your fresh seafood to grill!! Note: Master bedroom has an extra twin bed. South end of the island is superb for long leisurely walks, bicycle riding and getting to the beach in a flash. Restaurants and shopping all within a few blocks. For sunset watchers, the south end is the one spot to take in the gorgeous colors of dusk. A great place for making memories! This home is right beside Southern Cross Cottage so you can have two families stay together. Pet-friendly with fully fenced yard. Complimentary off-street parking for 4 cars. Brooks Cottage was fantastic! The home was even better than the gorgeous photos online. Very spacious that allowed our group many options for coming together as a group or having some space. 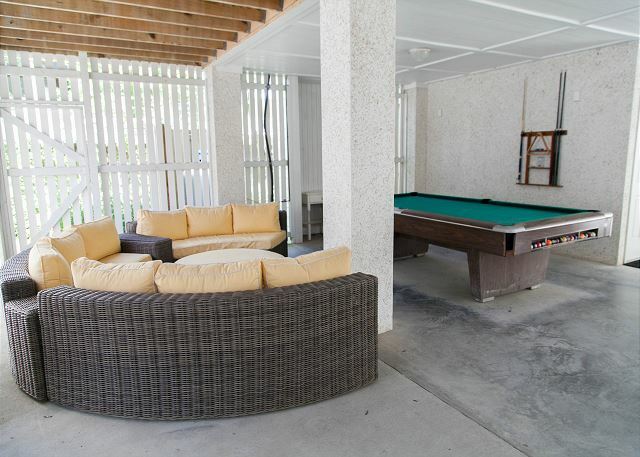 The 3 screened in porches were amazing and hard to leave. The location was ideal, very close to the beach from several easy access points, close to shops and restaurants. The Mermaid staff was very attentive and checked in during our stay to see if we needed anything. I would highly recommend Brooks Cottage or any Mermaid home. We can't wait to come back for more Brooks and Tybee charm. Our family of four humans and our two dogs loved the Brooks Cottage. 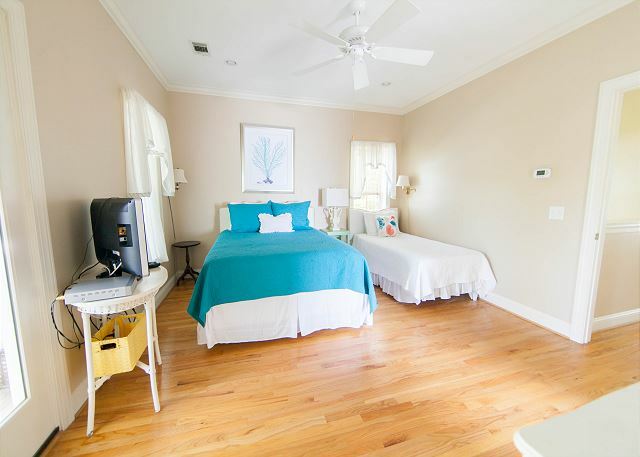 It's in a great location at the bottom of Tybee, allowing easy access to both the river and ocean beaches, as well as refreshing ocean breezes. 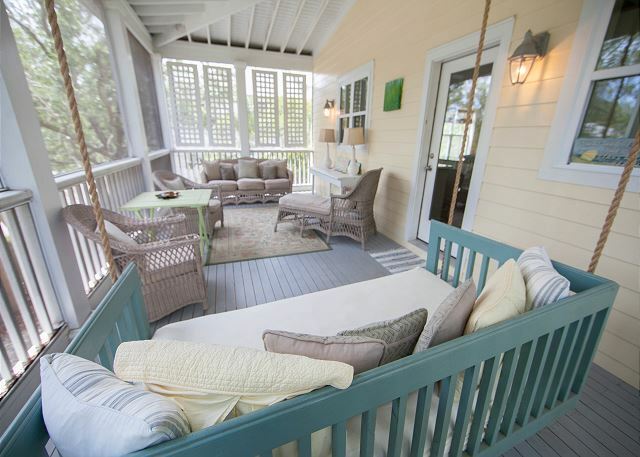 The ground level play area provides hours of fun, and the multiple porches are lovely and so relaxing. Highly recommended. 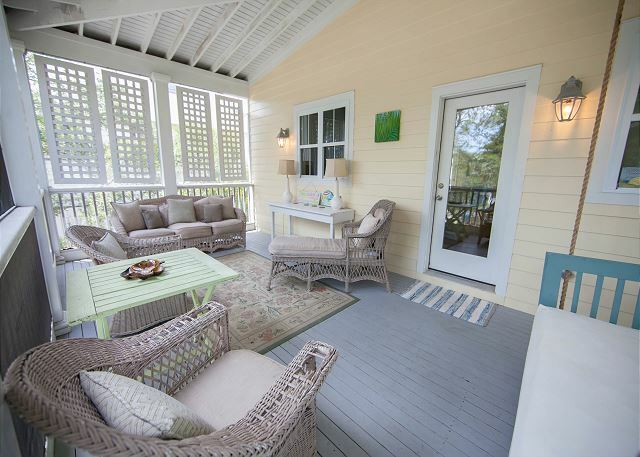 Cute beach home with fabulous porches including a sleeping porch that we all loved! Easy walk to beach and plenty of room to park. I’ve been renting from Mermaid for years. Their cottages are the cutest. My latest rental was the Brooks Cottage, I rented it before and love it. The house was comfortable and clean. The space under the house and fenced yard were great for an energetic toddler and two dogs. The bedrooms and layout were comfortable for two families. The location was perfect. Steps away from the back river just across the street. The property management company checked on us before and during our stay and helped to answer questions when I didn't read my emails. We will definately stay there again. Wonderful home, location, and great service. 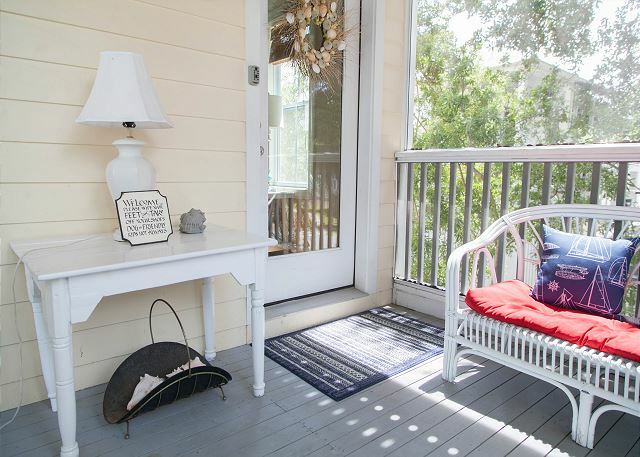 Wonderful porches & great location!!! 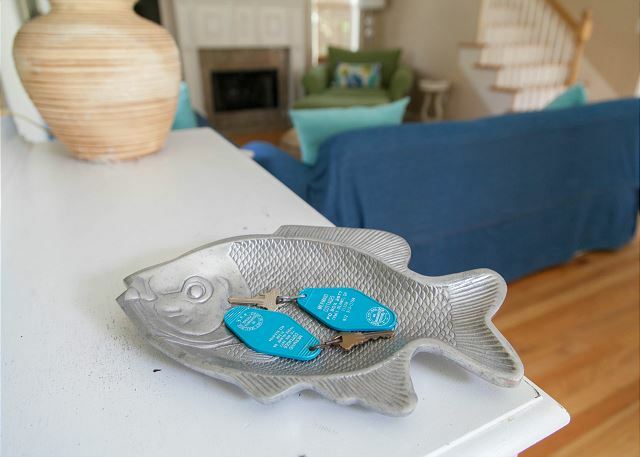 Brooks cottage is just a few blocks from the beach, river, pier and shops. Easy walk or bike ride. We all loved the location as there was something for everyone (and never had to get in the car! 🙌?�). The layout of the house was perfect and we enjoyed the open floor plan. Lovely huge porches to delight in a cocktail, chit-chat or read. The Mermaids were very helpful kept in contact through out our stay. I appreciated the cleanliness of the home and additional supplies provided (coffee, soaps, paper products,etc). Tybee is a spirited fun beach town with lots of southern character. It was once again a great experience at Mermaid Cottages. Looking forward to staying here again. Here are a few videos we did during this stay. Brooks is the best! We've stayed in several Mermaid cottages and this combo of location, spaciousness, porches and comfort level was tremendous. Loved the walk to the beach, and the outdoor shower was heavenly. A couple of minor things: no ping ping table as advertised (initially disappointing), kitchen could use a couple of basics (salt, rubber spatula for eggs, more tall glasses) but those details are small in comparison to the overall fantastic experience. Highly recommend! This is our fourth year staying at Brooks Cottage and they really put some upgrades and money into improvements this year! Brand new front load washer/dryer, new boards in the outdoor shower, improved porch space off the master, TV with Hulu, Amazon Prime and Roku in the living room, lower twin beds in the kids room (I wasn't terrified they were going to fall out and kill themselves this year), a closet we could use that wasn't locked in the master! Small things but big when you are staying for a week with three younger kids. The house really does feel like a home away from home and we always look forward to our week at "our" vacation home each year! We are a short walk from the beach or the inlet for calmer days which is great. My kids LOVE the porch swing (we live on that porch in the morning). 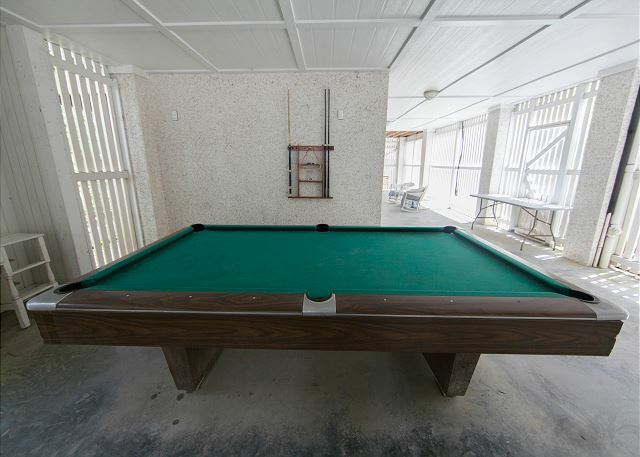 Pool table in the downstairs for extra recreation when the beach has gotten the better of us. 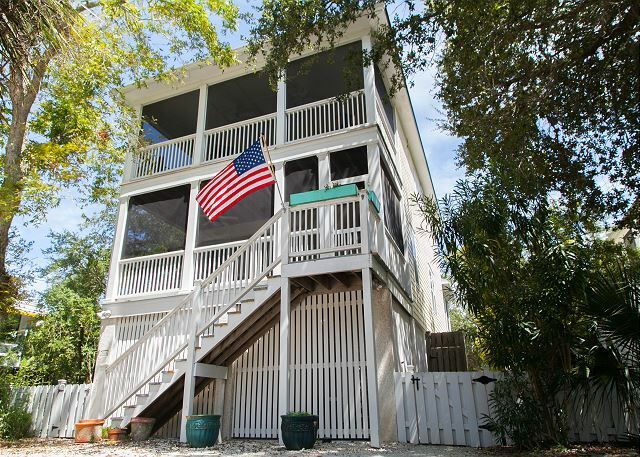 WE LOVE THIS HOUSE and we LOVE TYBEE! Thanks for having us again and we will see you again next year...maybe for a few days longer. We just wrapped up a week at Brooks Cottage which was our third time in this particular house and our fifth or sixth time staying in a cottage managed by the Mermaids. Every home we stay in is always incredibly clean, even those which accept dogs, which we greatly appreciate! 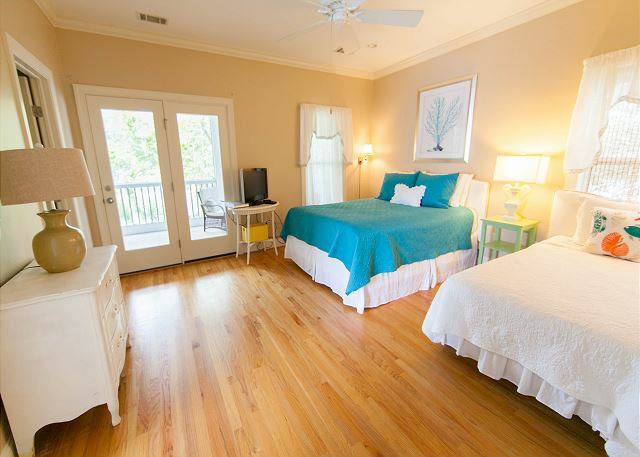 Brooks is close to the river and to the beach and we love the quieter end of Tybee. Can't say enough about the wonderful service the Mermaids provide each and every time. They're always ready to help even on a Sunday when your kid happens to fall and fracture his arm. Diane guided us to a great urgent care place which was a great comfort. In spite of this mishap, we had a wonderful week and are already planning our next trip down! Thank you! This house was wonderful. The house is better than the pictures in that it's hard to capture the charm of the furnishings and the wonderful condition of the house. 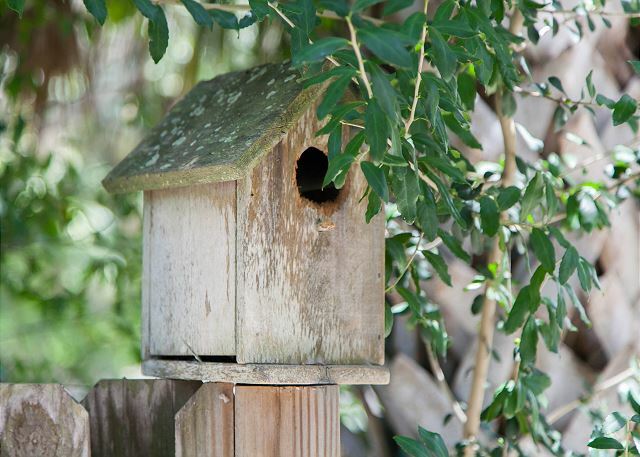 It was truly like living in someone's lovingly cared-for home. The house was so clean and there is everything you could want. The location is at the point and entry to the beach is across the street, very close. The porches on the front and back are beautiful. I kept saying--I wish this was my house! It can't be better than that. Wonderful house with all the amenities. Close to the beach. Would definitely stay there again. The Brooks Cottage was above our expectations! When we walked into Brooks Cottage we were in awe. Not only is it absolutely beautiful; it is also very comfortable. The kitchen is fully equipped so we could cook when we wanted to. The screened porches were a dream and our dog especially enjoyed them! The beach is a short walk away which is so convenient. Our stay couldn't have been any better. 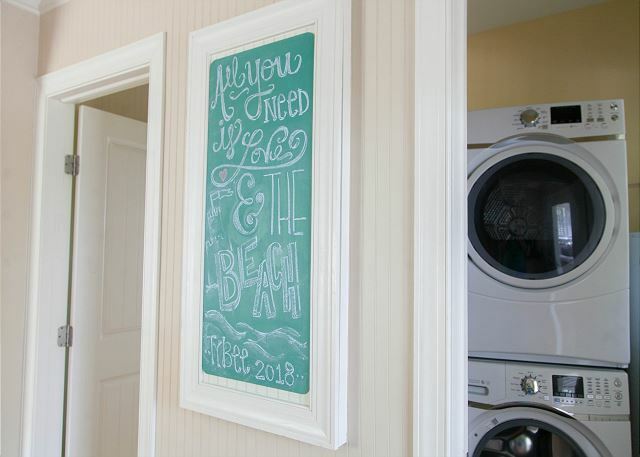 The home is beautiful and Tybee is our favorite vacation spot! Loved it all! VERY NICE HOUSE IS THE BROOKS COTTAGE,THOUGH, MOLLIE OUR 14 YEAR OLD DOXIE WAS NOT IMPRESSED WITH THE STEPS. GREAT LOCATION, VERY QUIET, CLOSE TO ALL THE HOT SPOTS. SCREENED PORCHES WERE TERRIFIC. GREAT PLACES TO KICK BACK. ALL IN ALL A TERRIFIC WAY TO USE A WEEK. This is our fourth year renting through Mermaid Cottages and our third home. They have all been lovely, but Brooks Cottage was by far the best location for us. The beach was easily accessed going across the street or down the road. Town was right around the corner for breakfast, ice cream, shopping, bike rentals. We were still close enough to walk to AJ's Dockside restaurant and kayaking/paddle boarding rentals. The screened in porches on this home were wonderful for relaxing and watching the rain fall. We did have several rainy days but enjoyed the time together in the cottage. Kids had fun playing ping pong and pool. We loved Brooks Cottage, especially the three screened porches and the hanging bed. Very relaxing and pleasant. Only a few blocks from the beach. Great location. This was our first time renting the Brooks cottage and it exceeded all of our expectations in every way. Upon arrival of the house, the ambiance was so relaxing! There was music playing as we walked in the door and the house was impeccably cleaned. The cleaning crew of Candace and Adam did an amazing job and everyone of the little details was evident. The house smelled fresh, the beds were so clean (and comfortable) and even the porches were pristine. The location of the house was so convenient. We thought we would have to rent bikes but we were so close to everything we just walked. The house is one (short) block from a less populated section of the beach or two blocks from the pier section and all the restaurants and shops. The house itself is shaded by wonderful landscaping so it stays cool, even on the back porch. All in all, this was my favorite rental place ever on Tybee! 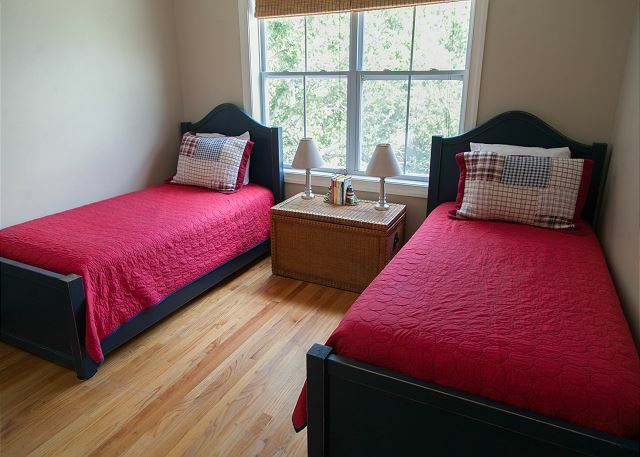 Stay and very convenient to the beach and local restaurants. The staff of Metmaid Cottages was very friendly and quick to respond on my questions. Happy to hear you enjoyed your stay with the Mermaids at Brooks Cottage! Come see us again soon....your Mermaids! Our family had a wonderful and relaxing week at this lovely home on Tybee. 4 of us had a wonderful stay at Brooks Cottage. 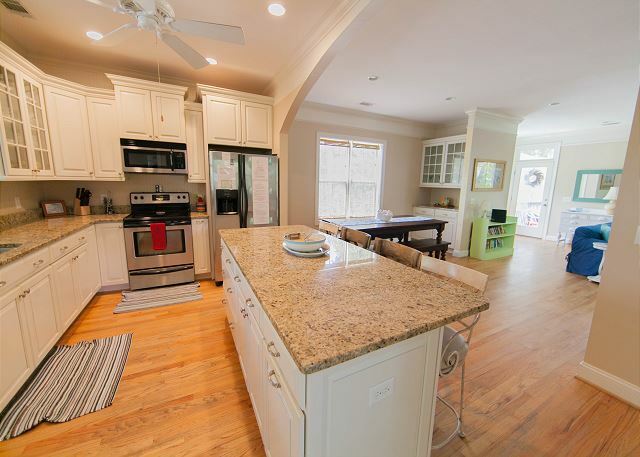 The house is clean and bright and has everything you need. Excellent service as always from the Mermaids - they called the day before our arrival to let us know the built-in microwave was broken but that a repair was scheduled - and they brought a counter-top microwave in the interim! With all those beds, the ping-pong and pool table underneath, and easy walk to the beach I would definitely come back with the kids. The home was immaculate and very comfortable. I can't say enough about the three beautiful porches. 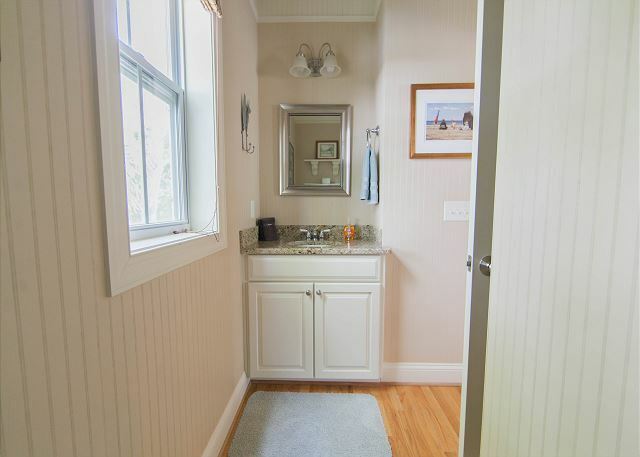 The home is in walking distance to the beach which was actually a dual-edged sword. On Saturday, cars descended on the area and traffic was coming and going for most of the day with the alley behind the house parked full of cars. It definitely detracted from the charm of the beautiful back porch. I would also caution anyone who has an issue with stairs that this may not be the best property choice for you as there are a lot of stairs to navigate. 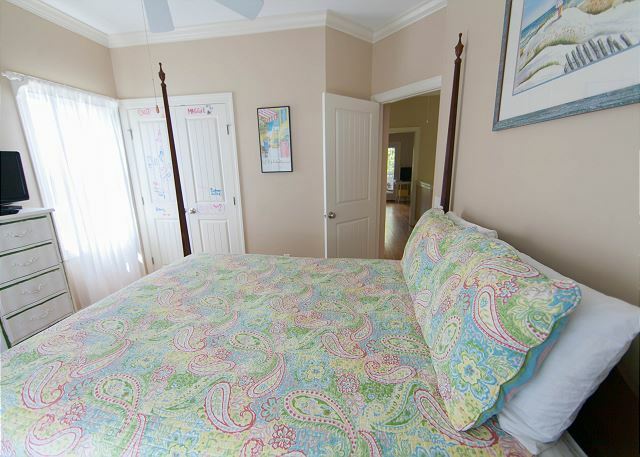 However, the house is lovely, clean and well-maintained and close to the beach and restaurants. BEAUTIFUL HOME!!!! BE PREPARED TO BE AMAZED! and will definitely stay longer! We barely left the cottage we were so comfy! This was a return visit and well worth it. 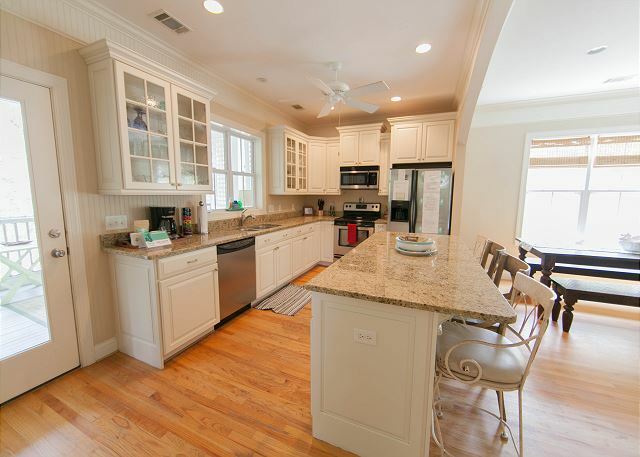 Brooks is a lovely home, in a perfect location on the south end of Tybee. We were able to spend Thanksgiving with our sons and their family who live in Georgia. The beach access is so close and a quick walk to the fishing pier. Mermaid Cottages are the best. Had a problem with ripped screen on back porch due to hurricane and they had it fixed the next day. The porches were so nice and the weather in Nov. was perfect. We have stayed on Tybee the last 5 years in the fall and by far this is the best rental. Thanks you for being pet friendly! We loved Brooks Cottage and had a wonderful weekend. Can't wait to come back and visit until we have stayed in all of the Mermaid Cottages,as they all have so much personality! Our group of 5 women stayed in Brook's cottage this year. We have stayed in other Mermaid Cottages in the past and have always been happy with everything. This cottage was perfect for us. The screen in porches were amazing. The location was great. And the cottage was very clean. 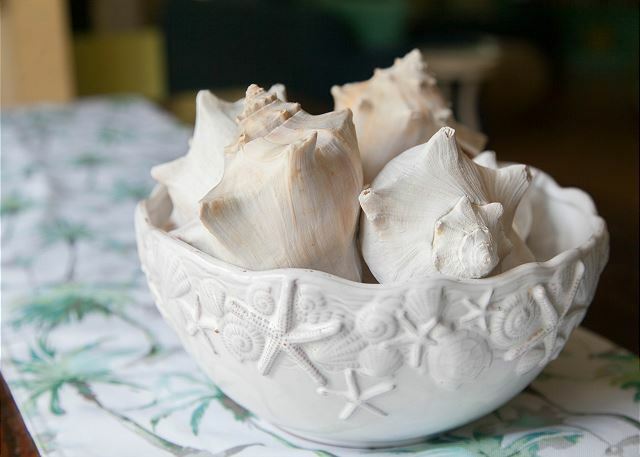 We highly recommend renting from Mermaid Cottages. They are awesome! This was our third time staying at brooks cottage and it was great as usual. Close to the beach but on a quiet street. 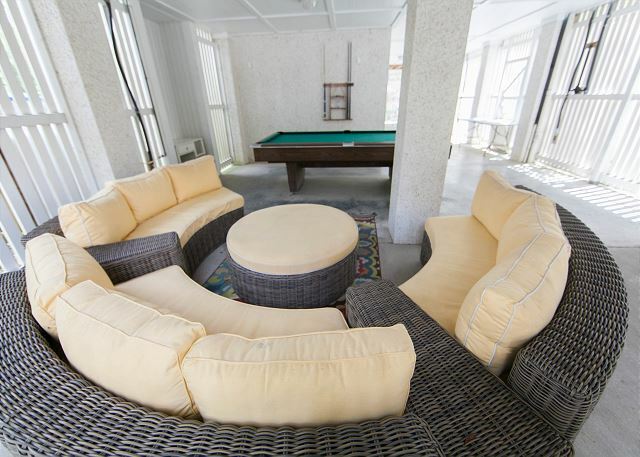 We love this location with the adjacent access to the beach, actually situated between four access points to different areas of the south beach. When we stay in Tybee it will always be at Brooks Cottage. We had a wonderful vacation at Brooks Cottage. Great location, close to the beach. We rented bikes and avoided driving. Everything we needed was close by. I would definitely stay here again! Stayed with 2 grown children, husband and mother. We all have memories from Tybee as children and I especially have good ones of the Back River area. The house was decorated beautifully and had everything we needed. We loved the large back porch. The only negative comment is the bed in the Master bedroom was a little soft. Might be time for a new mattress. We all said we would like to stay at The Brooks Cottage again. We have stayed at about 5 different Mermaid Cottages and have loved all but 1. This one was our Favorite!!! We loved the 3 big screened in porches. That is where we spent most of our time. It was clean and had everything we needed. 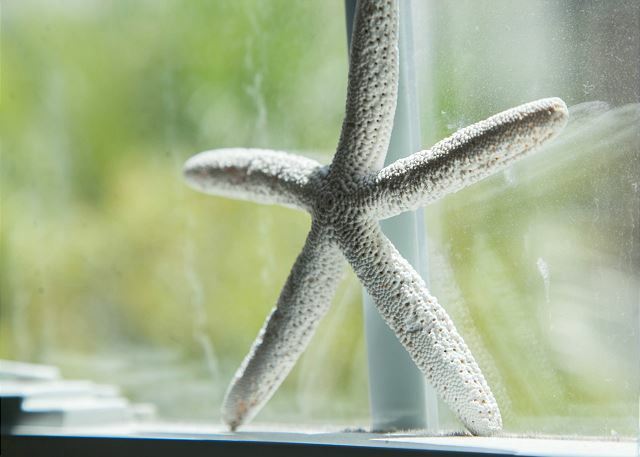 We will always stay at Mermaid Cottages and we have always had a great experience with all of the Mermaids!!! It was also a great location! Great location. One block to beach where river meets ocean. Three blocks to second beach entry. Walk to breakfast and pier. Dog friendly. Fenced yard for dog. I read the previous reviews so I knew to bring a Teflon pan since we would be cooking breakfasts. Otherwise, the kitchen is fully stocked. Also, the master bedroom has no hanging closet. There is a three drawer chest and a hall closet with shelves. And the other two bedrooms have closets. Porch off master needed cleaning but it was still pollen season. 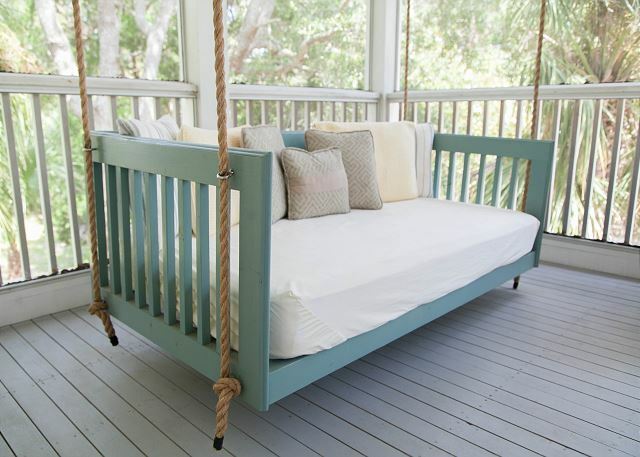 The porch off kitchen has an awesome bed swing. Loved it! Thank you for a great 30th anniversary vacation! Loved the easy access to the beach and town. The weather was wonderful. Brooks is a great location to ride bikes from. Spent a fun trip to Savannah. The three of us who tried could not figure out how to operate the TV. Other than that it was awesome. We stayed here for the month of February 2016 and had a wonderful time. We grew up in Savannah and have family and friends here so it was nice to be able to spend time with them during the month. The Brooks Cottage was perfect for us. There was plenty of room when our family and friends came to visit. The location is great...a block from the back river and a couple of blocks to downtown and the beach....great for walking and riding bikes. The sunsets in the evening were amazing...a short walk to the back river. The house was lovely and had everything we needed. It was clean and very well-maintained. The Mermaids were awesome. I called and left a message with a few questions I had and they promptly called me back. Tybee has great restaurants too. Some of our favorites are the Sundae Cafe, North Beach Bar and Grill, 80 East, Spanky's (great chicken fingers and spuds), StingRay's, A-J's Dockside, The Crab Shack, and MacElwee's. We also loved the Tybean Art and Coffee bar....great latte's. If you enjoy a nice breakfast, head over to the Breakfast Club or the Sunrise Restaurant. We brought our yellow lab with us, so we put in quite a few miles walking during the month. There is also a dog park on the island that I took him too. I would definitely recommend the Brooks Cottage. We will be back and will be renting from the Mermaids again and hopefully the Brooks Cottage will be available. Perfect relaxing beach trip to Tybee Island with friends. Very close (5-10 min. walk) to the beach and inlet. Low-key mini vacay and exactly what we all needed. The guys stayed in this house and loved everything about it. We entertained ourselves with the game room downstairs and the bedrooms were all comfortable. Great place! We enjoyed 4 days of relaxation. The home was beautiful and well kept. It actually had more than we used. Location was perfect. Everything was easy to get to by bike. It was our first time on Tybee Island. We'll definitely be back. Brooks Cottage is just a dream for our family. The kiddos love the porch and there is plenty of space for them to be kids. It is super close to the beach (in two different directions) which is great to keep the cars from getting sandy and equally close to downtown shopping and restaurants to avoid having to pay those nasty meters! This was our second stay at Brooks and our kids (4mths - 4 yrs) feel like it is there home. Lots to do with lots of amenities. We will be back! The only thing I wish is that some of the non-stick cookware in the kitchen was in better condition but next year we will just bring our own. Our stay at Brooks Cottage on Tybee was wonderful. The location was perfect. The house was well suited to our needs. My husband and I brought our son, his two best friends, my daughter, and her boyfriend. And our dog as well. Linda checked on us after our arrival via phone to see if we needed anything and if all was to our liking. My husband and I, plus our young adult daughters and boyfriends/husband for various parts of the week, spent a week at Brooks Cottage in mid June. The cottage was beautiful and had everything we needed except was a little short on beach towels; but we had brought some of our own. Although the open concept main level had plenty of room inside, the comfy porches were everyone's favorite place to hang out. The cottage is an easy walk to several different beach areas depending on whether you want quiet or more action. It's also an easy walk to AJ's where we ate a couple times. The mermaids were awesome and a great source of info on restaurants and things to do. In addition to AJ's, other favorite restaurants were the Breakfast Club (AMAZING! ), Hucapoo's, and Tybee Social Club. Also, a must do is a trip to Little Tybee with Dave and Renee of Sundial Charters. It was a highlight of the trip for everyone. Wonderful stay with the Mermaids! Brooks cottage was wonderfully appointed, making it a very comfortable home away from home. We spent a lot of time on the porches, even napped on the sleeping porch! The kids loved playing ping pong and pool each night and it was a nice walk to the beach. The mermaids took great care of us while we were there. The Mermaid coffee was delicious and much needed after our long drive. When we got in late the first night we accidentally locked ourselves out and they were very kind and timely in coming to let us in! There were definitely things that we didn't get to do our first stay on Tybee, but we will definitely be back! Thank you. We had a group of sea kayakers working on rough water skills. The house was perfect for group cooking, classroom presentations on the large back porch and for relaxing at the end of the day. This is a well built, well thought out house, nicely decorated and comfortably appointed. 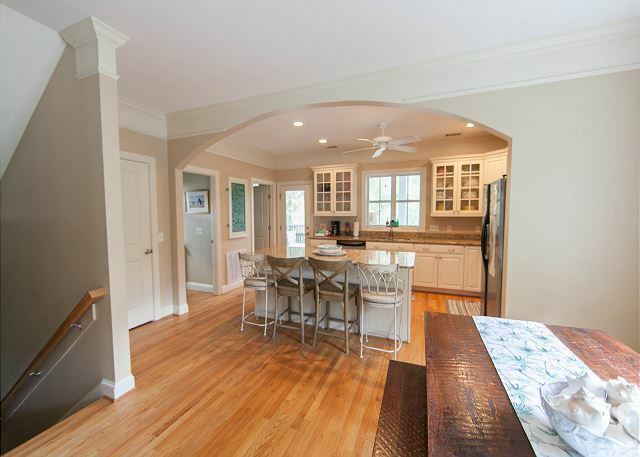 It's a fairly new house with all the modern conveniences, but with a nice, old feel, built in the tradition of the old Tybee cottages with wood floors and bead-board walls. The folks who built this house knew what they were doing. What a wonderful place. We had a wonderful stay in Brooks Cottage! 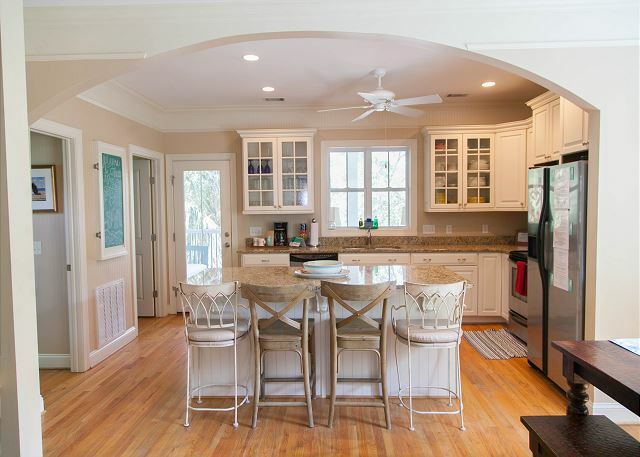 It is a lovely beach home with a beautiful kitchen and porches. We had a short walk to the beach with was perfect for kids. Great experience! Had a great time at Brooks Cottage! The moms enjoyed the back screened porch! Kiddos loved the "basement" with pool table and ping pong table. Our tween girls loved the front porch swing. Didn't want to leave! It was great. 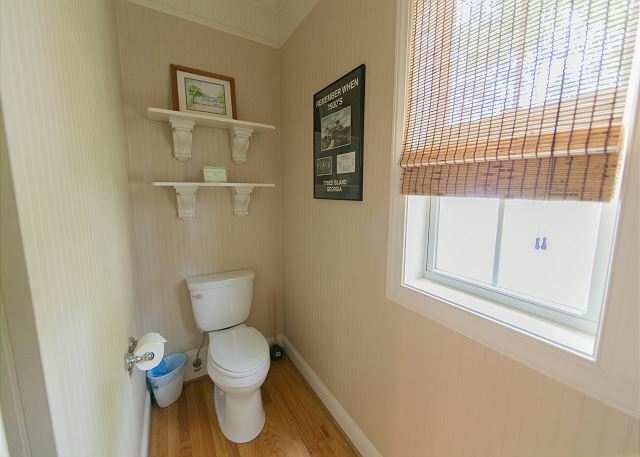 It is rare to rent a place on-line and the pictures to be accurate. In most cases the pictures on the internet were taken when the place was new. With Brooks Cottage the pictures were spot on. We really enjoyed the cottage!! We stayed in Brooks, a lovely cottage at the south end of Tybee. The weather was wonderful and the water lovely. Unfortunately, Comcast turned off our cable Monday morning. Mermaids and the owner did everything possible to solve the problem but it was off for 4 days. We would have spent more time on the beach but a movie crew blocked our access for days. It was necessary to walk to the next access. Mermaids came out immediately to solve a kitchen problem when we checked in. Frances was most helpful. happiness on the South End! Great house with the most wonderful porches! Location was wonderful for the beach and for bike rides and golf cart rides. The house was beautifully decorated and very comfortable. This is the second time THIS SUMMER we have stayed at Brookes Cottage! We have absolutely loved our stay both times. We are so sad to see it is on the market. Hopefully, it will continue to be a part of Mermaid Cottages so we can rent again in the spring. Wonderful Family Reunion on Tybee Island! My sister and I rented two Mermail cottages, side by side, the Southern Cross and Brooks Cottage. It a wonderful vacation. The houses were great, the porches were wonderful, they were the best!! The location of the two homes on the island was ideal. We had a number of beaches in walking distance along with the river. We were in walking distance to AJ's , a great restaurant, sort of off the beaten path. My car was packed with some items that were never used because both homes had everything that was needed for cooking for a total of 19 people. The Mermaids were so accomodating, they made sure we were all tucked in a clean home with great pillows and sheets, they even brought us more hangers for clothing...and we didn't even ask!! Carol Martin was our go to person and did an outstanding job. We couldn't have been happier with this property. We stayed at Blue Moon Over Tybee last year as a family of 4 and then loved it so much we decided to include my brother's family this year. Brook's Cabin was a perfect fit for both of our families. We would highly recommend it to others. Brooks Cottage was a great house for 8 people to stay in. Plenty of room to spread out and enjoy Tybee. Loved the screened in porches! 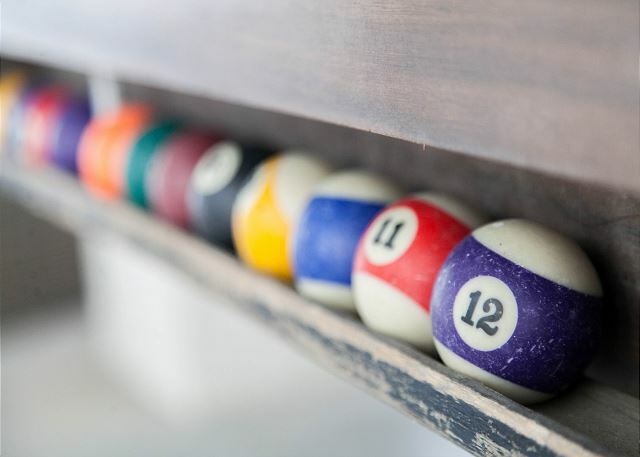 The family played for hours on the pool table most nights. We had a wonderful week at Brooks Cottage. 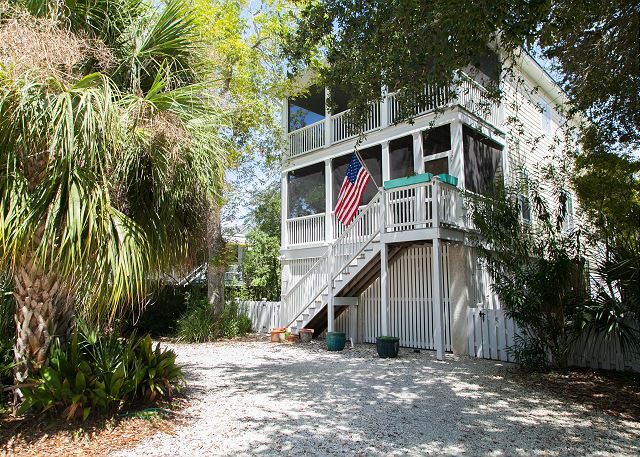 The house is conveniently located near the 18th Street beach access. The spacious and well-equipped kitchen made cooking dinner for our gang of teenagers so easy. Loved the 3 screened porches. Please provide sheets for the twin beds on the porch off the master bedroom and a replacement nozzle for the hose outside. While the dining table seats 6 fairly comfortably, another dining area outside would be nice (the small table off the kitchen doesn't work particularly well for anything other than morning coffee). 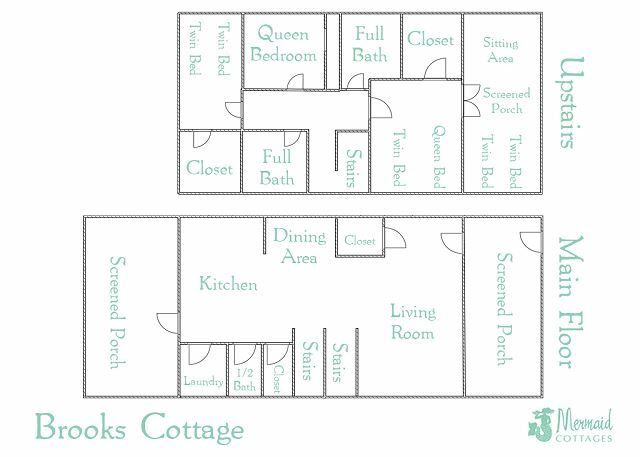 Constructive criticism aside, we will definitely rent Brooks Cottage again! Very lovely! Peaceful! Pets enjoyed their time also! We stayed at Brooks Cottage for a few days and totally loved it. 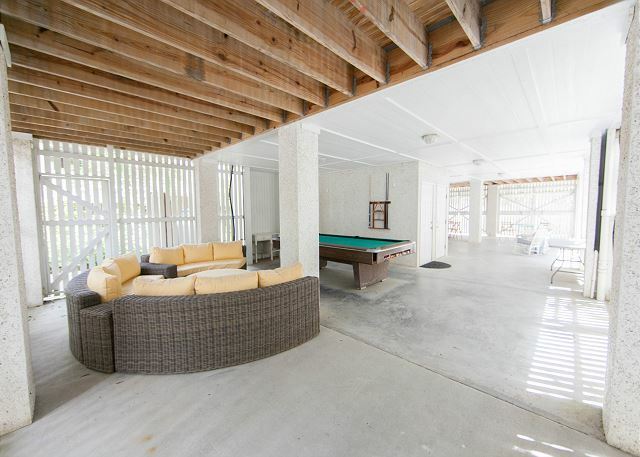 The large screened back porch was a perfect hangout. Unaware of how busy St. Patrick's Day is in Savannah, I booked flights to meet up with family for a long weekend. 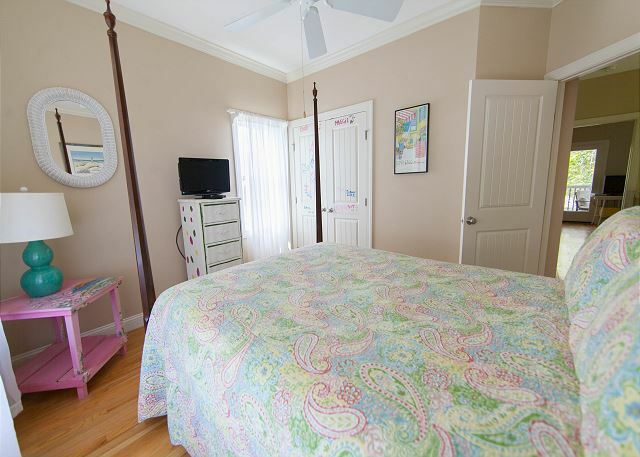 When I mentioned how crazy expensive hotel rooms were, a friend recommended I call Mermaid cottages. They were great! 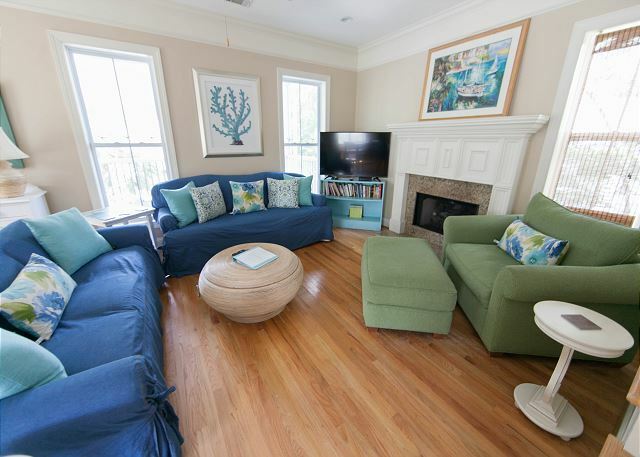 The house was beautiful spotless and in a location on Tybee that allowed for walking to town and the beach (and cheaper than two hotel rooms). I will most certainly be back, and will call Mermaid again. What a wonderful way to spend the holiday! Sunsets galore and dolphins!!! It really was an awesome house, clean, roomy and bonus with Ping-Pong and Pool tables! Our week at Brook's Cottage was perfect. The home is spacious, well equipped, very clean and conveniently located. The screened porches were wonderful areas for morning coffee and evening cocktails and the ultimate place for our two Havanese to people and dog watch. The fenced yard was a bonus! We love the cottage and the excellent service provided by Mermaid Cottages. We hope to return in the spring. We had a great time at Brooks cottage; the Mermaid gals are great and the island life is awesome. This cottage is wonderful. We had big family dinners in the roomy kitchen, loved the 3 screened porches, it's well appointed with almost all the cooking and dining-ware you need to serve a family, and it's in a great location on the south end of the island. We're ready to move in! Beautiful house, well-appointed and furnished. 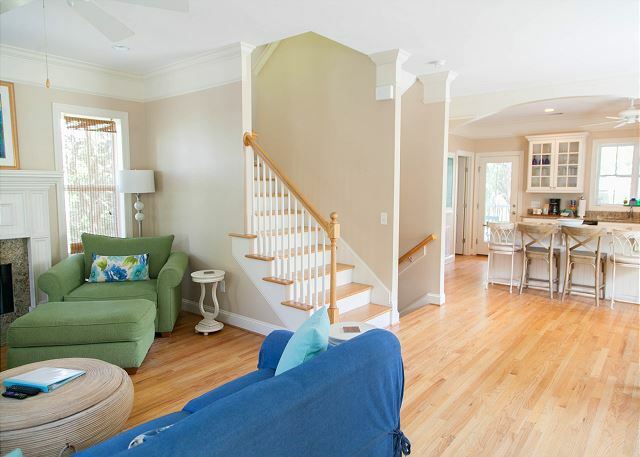 Super clean w/ great light, and lots of decks upstairs and down. Would love to host a gathering of friends and family they next time we're down. A few bugs got in, but it's the tropics, at the beach, so it's to be expected. Plus, we have small kids, so we'd prefer the pests over the pesticides. Some natural remedies would be welcome. Would highly recommend Mermaid Cottages, staff and customer service, and especially Brooks Cottage. Thanks again. We LOVED Brooks Cottage. We've rented many houses/condos in many places and this is the best ever. This was truly a home away from home. The house was very clean. The furnishings were better than most beach houses. The proximity to the beach was great for us. Just a 5 minute walk,with more than one choice of entry points. It was relaxing just sitting on the porch setting in the morning, reading a book before hitting the beach. The fact that we had three screened porches to choose from was a bonus. The house was well equipped with kitchen items, appliances and two washers/dryers! Would I recommend this house to others? Well, yes, but maybe not. It's a nice secret to keep for ourselves! My family and I enjoyed our stay at Brooks Cottage. As always, the Mermaid staff made sure that everything was perfect. The "big kids" really liked the game room and Mom and Dad loved the kids having their own bedrooms and bathroom!Thank you for sharing your home with us. We enjoyed our vacation and will definitely stay with Mermaid Cottages in the future. My wife and our adult children really enjoyed our stay here recently. 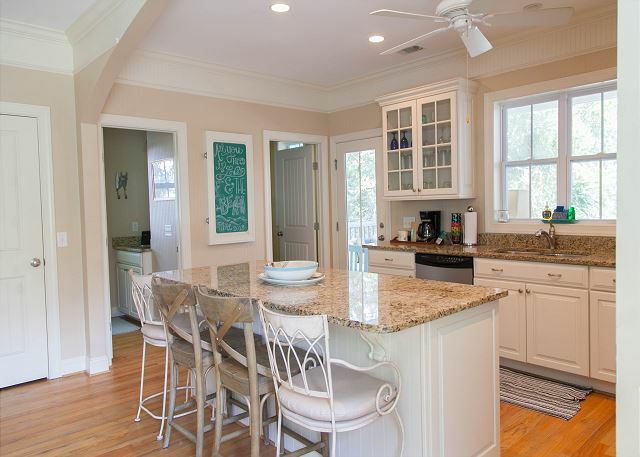 The location is terrific, walking distance to beaches and restaurants. The porches were wonderful, mornings in the back, evenings on the front. Ground floor had ping pong, billiards,bikes and the grill, which were all used to great enjoyment. A couple of cons: The master bedroom had no closet space (locked for owners use) and so I had to stow my gear on the porch outside the bedroom while my wife took the small chest of drawers for herself. Also, the climate control on the main floor barely worked, but by design it was trying to cool a downstairs stairwell, an upstairs stairwell and the main floor. Finally, we had our share of low country insects in the house, but nothing a can of Raid couldnt control. Overall, 4 out of five stars for us, felt we got our moneys worth, even for peak season rent. My family and I loved the Brooks Cottage! 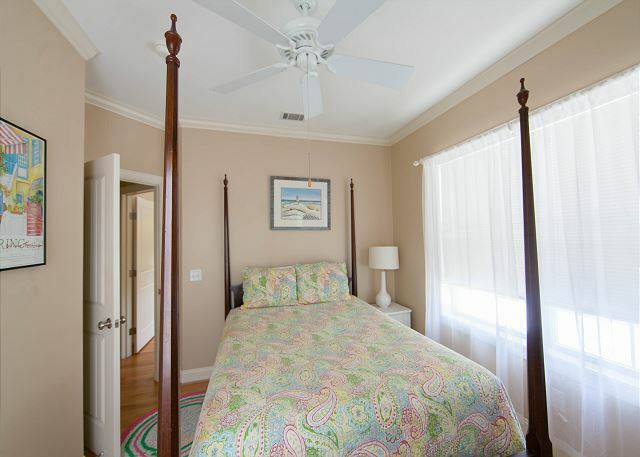 This was our first time on Tybee Island and the cottage had available many of the comforts of home. We absolutely LOVED the crockpot and used it several times. It was so nice to have a cooked meal waiting when we would return from the beach or bicycling. Thank you for all the amenities. The location was close to several beach accesses and both piers. A-J's Dockside restaurant is very close also - at the end of Chatham Avenue. You can see very beautiful sunsets while enjoying dinner. Thank you so much for allowing our two little chihuahuas. They loved the screened front porch; watching people go by. We screened porches were GREAT! We ate out on the back screened porch a couple of times! The mermaids were WONDERFUL folks! Very friendly and very attentive! Loved every minute of our stay and will be back again! We left behind four little "crabbing" sticks with rope, hook and sinker attached for anyone else to enjoy. We left them in the big silver tin basin downstairs next to the pool table. We used them down at Fisherman's Pier. We also left a small blue umbrella for anyone else to enjoy down on the beach. This was our family's first trip to Tybee and we had an amazing time. Best beach vacation we ever had and we've been renting beach homes for years. Brooks Cottage was spotless, bright, and comfortable. Plenty of room to spread out and relax, ceiling fans everywhere, and lots of extras you don't often find in rental homes. Like coffee service and soap by the sinks. Great spot on the quiet end of the island. We had a short walk to the beach and our kids enjoyed the boogie boards, skim boards, and beach toys that were available. The Mermaids crew couldn't have been more accommodating! Always on call and ready to do anything to make the stay even better. We will definitely be returning to Brooks Cottage! Thank you Mermaids! We had a really great time at Brooks Cottage. Loved the screened porches and the open kitchen! We will always stay with the Mermaids! We had a great 5 days at Brooks Cottage. It is so close to all of the beaches. Its an easy walk to all 3. The house itself is nice and big with lots of space for kids to play and porches for everyone to relax on. The house was perfect. Loved all the porches and the teens loved the game area . We've stayed in a lot of cabins and beach homes. 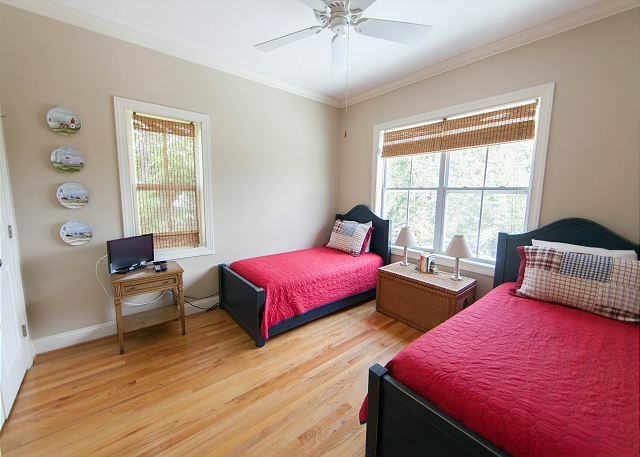 I would definitely recommend this to anyone looking for a place at Tybee. The only way I would improve on it would be to add a full length mirror maybe in closet of bedrooms. With teenage girls, I never could get mirror time:) Mermaid was a breeze to deal with as well. Tybee Island was a wonderful place to vacation. Mermaid Cottages was always available when we had a question. This was our second stay at Brooks Cottage, and we absolutely love it! 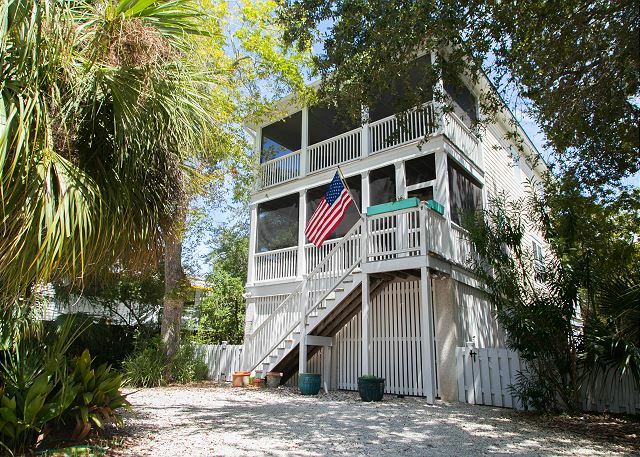 The three screened porches are our favorite feature, but, everything in and outside of the house fits the definition of a perfect beach house. As with all Mermaid Cottages I have stayed in, it was spotless. Excellent experience! 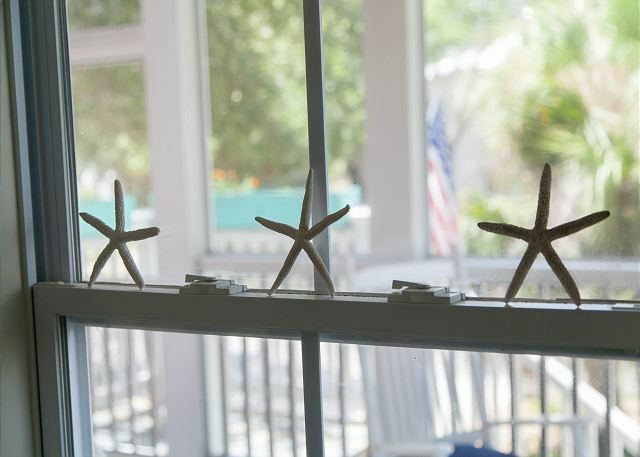 We loved our 3 night stay at Brooks Cottage in Tybee Island. Loved the location and close walking distance to the inlet and beach. We, the parents, took turns sleeping outside in the screened-in sleeping porch off the master bedroom. Sleeping outside in the evening breeze was great. My 85 year old mum (with a year old hip replacement) walked up and down the stairs with no problems at all. The kitchen was well stocked with everything. 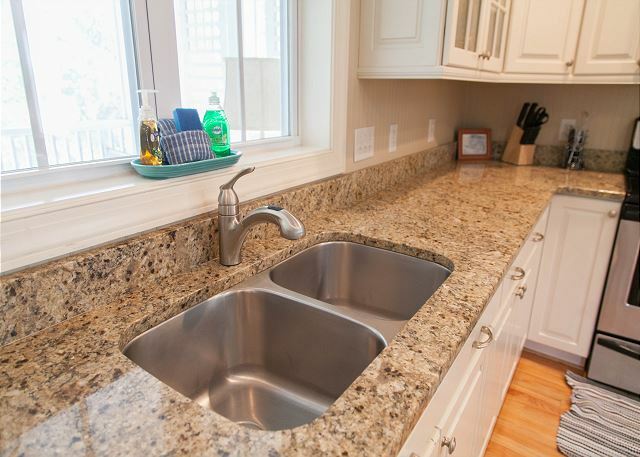 The only thing missing was a sponge to clean up with, but the management brought it over quickly with just one phone call to them :)Thank you for sharing your home with us. Absolutely the best vacation rental I've ever had. My daughter was married over the weekend that we rented and the house it made a perfect honeymoon suite(although the whole family was there) and it provided a beautiful space for both families to spend time together without crowding. House is gorgeous. We had kids sleep on the sleeping porch which I was worried wouldn't work and it turned out perfect. 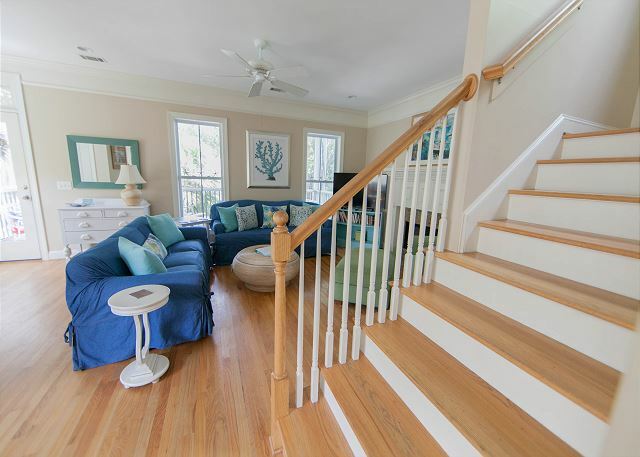 Lovely and comfortable house, amenities, distance from beach, screened porches, gameroom, are all perfect. Mermaid Cottage staff is oustanding.. will never look anywhere else at Tybee! My family of 5 plus two grandparents stayed in the house and had a wonderful time. 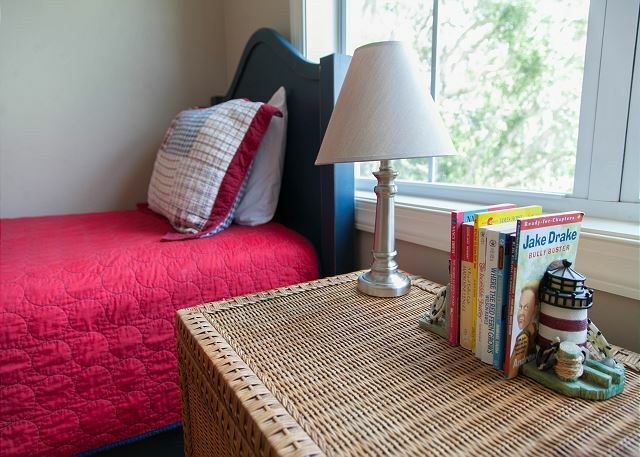 The house is beautiful and comfortable, and two of my children loved sleeping on the sleeping porch! They also enjoyed playing ping-pong in the open-air basement. Great property - great experience. We stumbled upon Brooks Cottage and the Mermaids via an online search. We wanted to "try something different" this year and this was our first experience with Tybee Island. We were extremely pleased with the location of Brooks Cottage (proximity to beaches, walking distance to "downtown", relatively quiet on Chatham Avenue). This is a well-kept "newer" property and is nicely appointed. The porches are just great. So was watching the sunsets from the "fishing pier" out on the back inlet. When not at the beach, our kids liked hanging out at the pool table and ping-pong table underneath the main floor. We were VERY comfortable here. We were extremely pleased with the booking, reservation and follow-up process and service from the Mermaids. Although we had no issues and did not have to call upon them - we definitely felt comfortable in knowing we could if we needed to - both for "house" issues as well as "vacation advice". We enjoyed a day in Savannah (our son loved the Georgia Railroad Museam) and an afternoon at Fort Pulaski...nice side-trips. 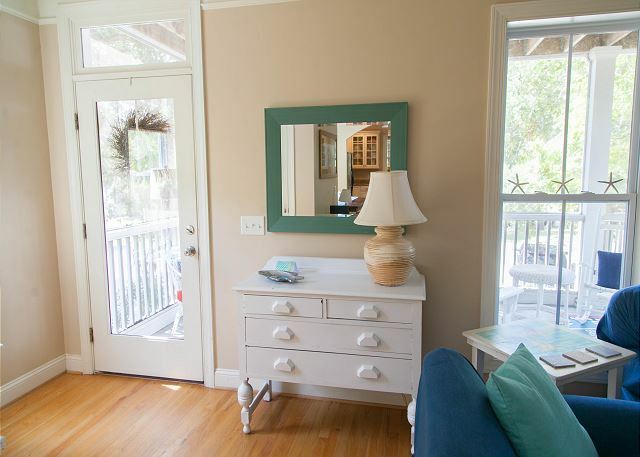 We hope to return to Tybee and Brooks Cottage some day! PS - I'd come back just for the "Morning Bliss" Coffee! 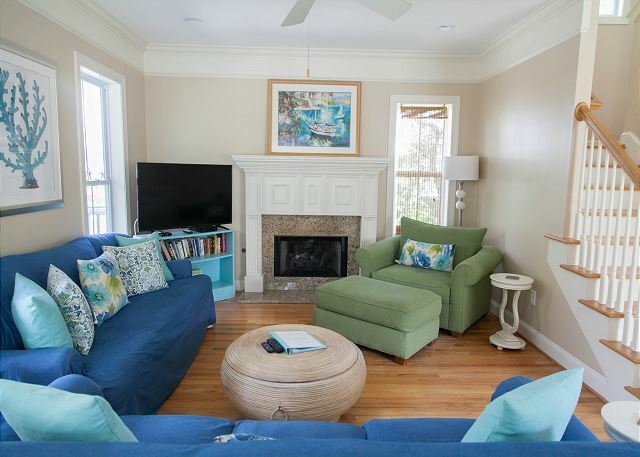 The fresh, clean coastal living interior of Brooks Cottage was a perfect fit for my family! It was just a short walk to the beach, the shops, and the restaurants! 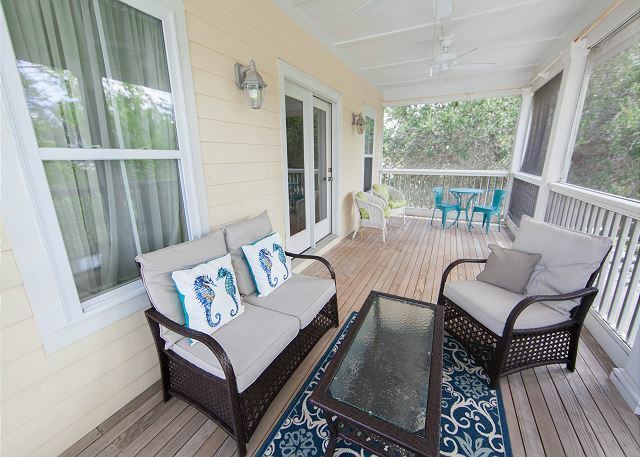 The screened in porches were awesome for hanging out and enjoying the cool evening ocean breezes! 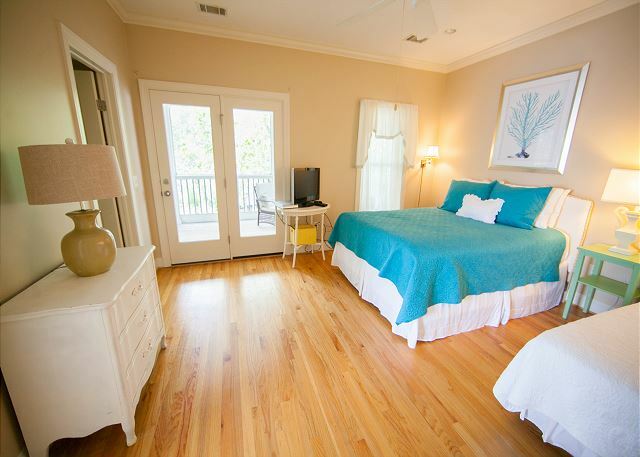 We loved our stay on Tybee Island and at Brooks Cottage! We loved Brooks Cottage and would stay again! Layout of house was perfect for putting our toddler to bed upstairs away from living room noise, screened in porches were great, master suite very comfortable, outdoor shower great for minimizing sand tracked into house. 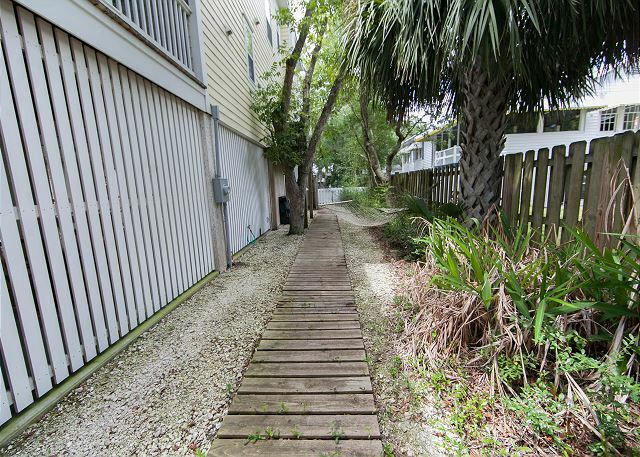 2 blocks from beach perfect walking distance and convenient location near pier. Very clean and spacious. Very helpful staff. Only suggestions, master bedroom doors to porch need blinds and the valance is very annoying as it gets caught in the door. Also needs large griddle or electric skillet for family style pancake breakfasts. Otherwise, absolutely fantastic! it was a very enjoyable trip,wish i had more time to spend there.rental was very clean,plenty of everything we needed.short stroll to beaches&fishing pier.there was 6 of us and we had plenty of space.especially enjoyed the time spent on the screened porches. Spring Break on Tybee is our favorite!! We had such a lovely stay at Brooks Cottage. 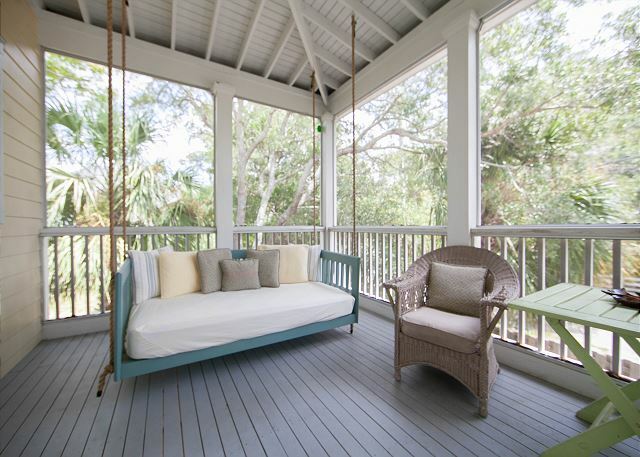 It is the everything a beach cottage is...beautful screened porches with comfortable furniture and porch swings. The location was excellent for the beach and neighborhood for biking and walks. I loved cooking in the kitchen and quick access to the back porch for eating or reading. This is our third Mermaid Cottage to stay at and so far our favorite. We had such a blast at the brooks cottage! We've visited Savannah every year since we graduated SCAD and now with2 kids, it was the perfect way to vacation comfortably! We LOVED the brooks cottage, hopefully we'll be able to stay there for many years to come! We had a wonderful relaxing Christmas in TybeeIt was our first trip and I want to come back again.Everything was sparkling and clean at Brooks Cottage. 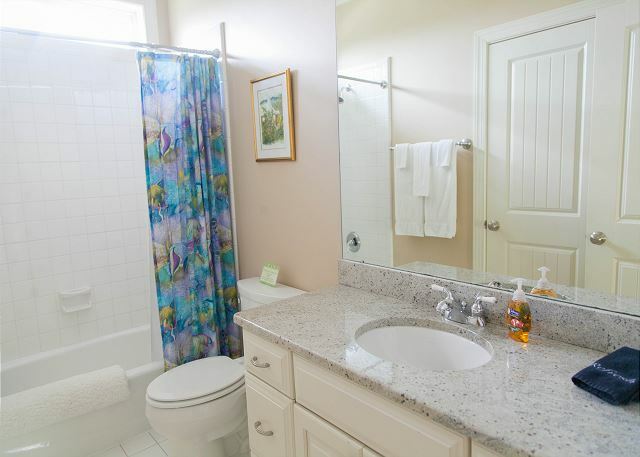 It is a property where the owner has spared no expense to have top of the line fixtures and accents. Beautiful, comfortable and just what a vacation home should be. Our two families met at Tybee for the first time. It was a wonderful experience! The house was gorgeous! Casual, comfortable, roomy and looked to be decorated by a professional. It was light, airy and beachy in a lovely tasteful way. I loved the art work in the house, it represented the island and beach perfectly. The sleeping porch was a blast. Everyone fought over who got to sleep there. We also got to bring our dogs, which made the vacation complete. The island is wonderful with beautiful new houses but most of all the super neat historical ones. Being from the gulf coast of Florida, I was surprised how beautiful the beaches were. I love that they are so natural. The proximity to Savannah was great also. Great house! Great Island! Will go back as soon as we can! My four girlfriends and I just returned from a stay in Brooks' Cottage on Tybee Island. The cottage was convenient to the beaches, restaurants and kayak ramp. The cottage was perfect for us with three bedrooms and decorated so cute. The Mermaid Cottage staff were so nice and accommodating. I highly recommend them. Great place! The Brooks Cottage was perfect for having my Grand babies come to town for the Piratefest. We were close by to the activities so we could come home for naps. The porch swing was perfect for snuggling with grand babies and reading them books. We all look forward to renting the Brooks Cottage again. every restaurant/shop. From the cottage, it was only 25 minutes or so to Savannah- easy van cab ride. The propery was immaculate and very well kept. 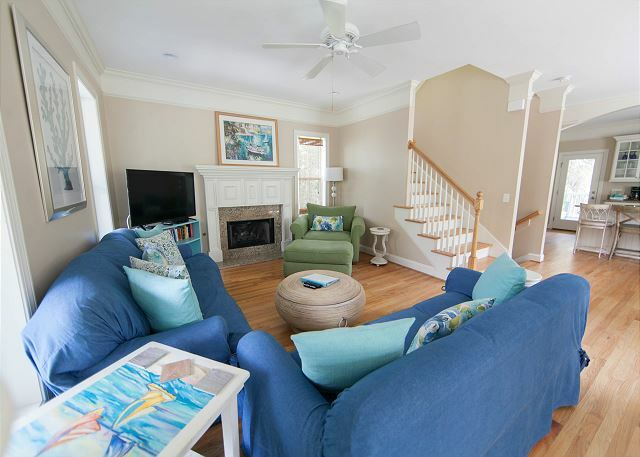 If we come to Tybee Island again- we will be sure to book Brooks Cottage. is wonderful. 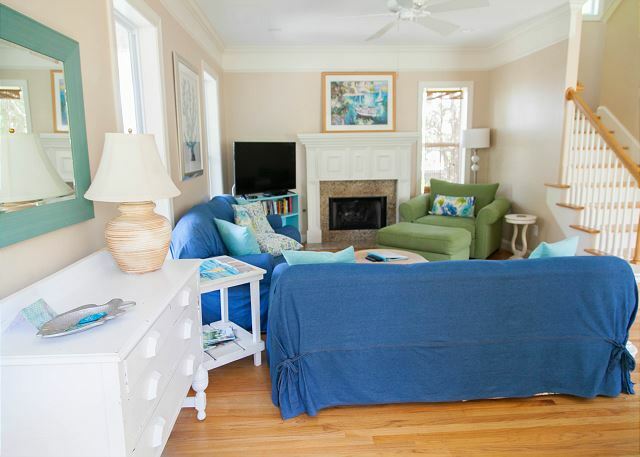 Already planning our next trip to Tybee and will definitely be booking with Mermaid Cottages! 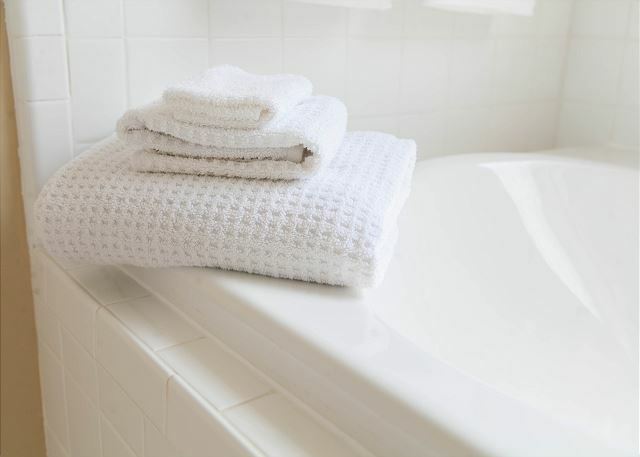 (1) The full size bed needs to be replaced with a queen sized bed; (2) there is very limited closet space, so an armoire would be a good addition; (3) in the limited closet space, there are no hangers; and (4) there are no hooks to hang towels on in the master bathroom. We look forward to staying here again!! There are no longer any twin beds on the second floor screened porch. It was previously furnished as a sleeping porch but is now furnished only with chairs.